The scene in this print is from the incredibly popular novel The Eight Dogs of Satomi by Kyokutei Bakin. Each of the 8 heroes represents a different Confucian virture. Each has the kanji character for dog as part of his name. Notice the puppies surrounding the title cartouche in the upper right. 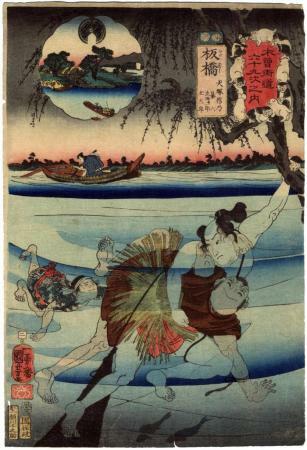 "In this scene... [Inuzuka Shino] tries to save his wicked uncle Hikiroku from drowning in the Kaniwa River. In fact, Hikiroku is able to swim and is really plotting to drown Shino with the help of Dotarō, who swims toward them underwater. Meanwhile, on the boat, another villain named Samojirō steals the precious heirloom sword Murasamemaru that has been entrusted to Shino, substituting an inferior sword so that the theft will not be discovered immediately. Shino escapes unharmed from the attempt on his life, but the loss of the sword will cause problems later on as the complicated plot unfolds." Source and quote from: Utagawa Kuniyoshi: The Sixty-nine Stations of the Kisokaidō by Sarah E. Thompson, p. 20.